Observatory weather: Smokey. Observatory operations shut down due to nearby fires. That is the ominous status of the Mount Wilson Observatory, located high atop southern California’s Mt. Wilson, where smoke from the nearby Station fire has shut down operations and may even threaten the observatory itself. According to CAL FIRE, the Station fire has burned over 35,000 acres and with 1,800 firefighters on scene, only 5% of the fire has been contained. As a result, Governor Schwarzenegger has declared a state of emergency for LA County. The UCLA Department of Physics and Astronomy has a live webcam located on the summit of Mt. Wilson. The 2-minute updates produce very large, scary 1280�960 images. Updates on the fire are available at InciWeb. The Mount Wilson Institute has also been posting regular updates on the situation at the observatory. 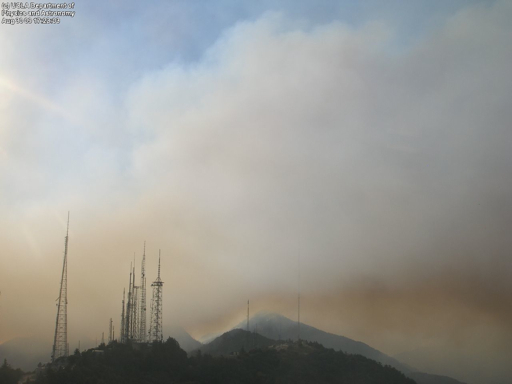 According to Hal McAlister, Director of the Mount Wilson Institute, the fire department has decided to keep firefighters in place overnight in order to protect the Observatory and the Communications Facility (several Southland radio and TV towers are located at the at the summit adjacent to the Observatory). “That’s very good news,” he writes.